The number of petascale machines grew from one (Roadrunner) in 2008, to 20 just four years later. 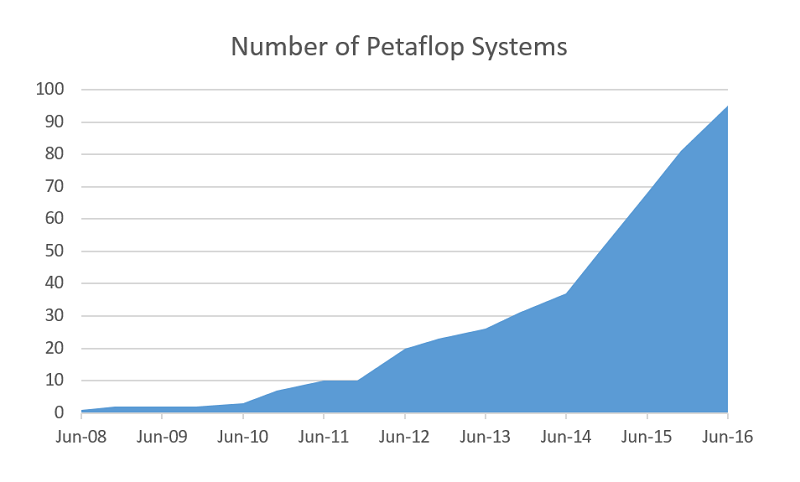 The next big jump came in 2014, when the tally grew to 50 systems. Its current level of 95 systems reflects a significant development in the petascale era: the expansion of these large machines into commercial and academic sites. In the commercial sector, this is especially true for the oil and gas space, which now claims four petaflop systems on this list, including the largest at Total, a 5.3-petaflop SGI machine known as Pangea. Other petaflop club members in this industry include Petroleum Geo-Services (4.0 petaflops), Eni (3.1 petaflops), and Saudi Aramco (2.2 petaflops). There is an additional 1.1-petaflop system housed at an anonymous US energy firm, which presumably is also involved in oil and gas exploration. In academia, petascale supercomputers have become even more prevalent. Eleven of these 95 elite machines are installed at universities, not all of which are associated with deep-pocketed supercomputing centers. It’s becoming increasingly common for at least large universities to acquire their own peta-machines for in-house researchers, rather than being dependent on the charity of national labs to share such resources. Japanese universities seem to be particularly well-equipped in this realm, with the largest system being a 2.9-petaflop machine installed at Nagoya University. Last week, both Cray and SGI announced new petascale systems headed for academic sites: a 5.4-petaflop (peak) Cray XC40 destined for Kyoto University, and a 1.9-petaflop (peak) SGI Rackable system that will go into production at the University of Tokyo in July. As an aside, the Cray system will be outfitted with Intel’s new Knights Landing processors, while the SGI machine will be equipped with NVIDIA’s recently announced P100 GPUs. These multi-teraflop processors from Intel and NVIDIA should make petaflop systems even easier to come by. A few hundred of such chips are now enough to reach this performance level, few enough to be housed in 100 servers or less if multi-processor configurations are available. It won’t be long before the petaflop club loses its exclusive standing entirely.